Tuesdays – Sundays, 10 a.m. – 4:30 p.m. The museum will be closed Sunday, April 21 for Easter. 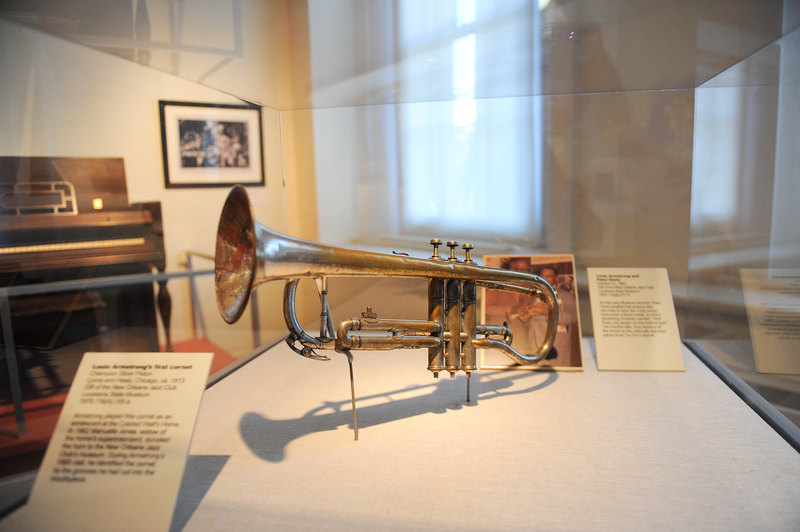 Admission to the New Orleans Jazz Museum will be FREE on April 30 in celebration of International Jazz Day! The New Orleans Jazz Museum celebrates jazz in the city where it was born. Through dynamic interactive exhibitions, multigenerational educational programming, research facilities and engaging musical performances, the music New Orleans made famous is explored in all its forms. Experience more here. Strategically located at the intersection of the French Quarter and the Frenchman Street live music corridor, the New Orleans Jazz Museum is in the heart of the city’s vibrant music scene. You can hear great music from some of New Orleans best contemporary artist at the $4-million, a state-of-the-art performance venue on the Museum’s 3rd floor. The near-perfect sound environment features advanced acoustics and sound recording equipment designed to enhance the listener’s experience and record the performance for historical archives. The Museum uses the space for evening programs, solo and small group concerts and special events while the National Park Service offers daily live music programs. Through partnerships with local, national and international educational institutions, the New Orleans Jazz Museum promotes the global understanding of jazz as one of the most innovative, historically pivotal musical art forms in world history. For more information, visit us here and follow us on Facebook, Twitter and Instagram. The New Orleans Jazz Museum, in collaboration with the Louisiana Museum Foundation and other educational and program partners, has launched a fundraising campaign to develop the world’s premier jazz exhibition. This new exhibition is designed to highlight the tremendous influence of New Orleans Jazz on the cultural fabric of the world. The first phase of the permanent exhibit is planned to open in 2020. Meanwhile, visitors can enjoy throughout the year a series of temporary exhibitions pulling from the Jazz Museum’s comprehensive collection as well as free musical performances weekly and special events in the evenings. The Old U.S. Mint is wheelchair accessible. Individuals with special needs are requested to contact Museum staff to make arrangements. The Old U.S. Mint is a historical landmark in and of itself, offering a fitting home for the seminal collections of the New Orleans Jazz Museum; read all about music at the Old U.S. Mint here. William Strickland of Philadelphia, who designed the Second Bank of the U.S., the Philadelphia Mint and the Tennessee State Capitol, designed the Old U.S. Mint as well. The simple, classic style of the building reflects the Greek Revival era. Completed in 1838, the Old U.S. Mint holds the distinct title of being the only mint to have produced both American and Confederate coinage. After the Civil War, the Mint was the only one in the South to reopen, resuming full operations by 1879. In 1909, minting ceased, and the building was used as a federal prison during Prohibition, then by the Coast Guard until the federal government transferred it to the state in 1966. In 1981, the Mint opened to the public as a state museum site. The Mint contains an excellent exhibit on making coins, with a Morgan & Orr coin press, a Troemner bullion scale and displays of coins minted on-site. Second Thursday Lecture: Dave Thomas on "The Fests Before the Fest"
The New Orleans Dance Hall Quartet featuring Norbert Susemihl, Chloe Feoranzo, Harry Mayronne and Barnaby Gold will perform traditional New Orleans Jazz from 2-3 p.m., Thursday, April 11. Join the Arrowhead Jazz Band from 2-3 p.m. in an up-beat performance demonstrating a variety of jazz and blues styles featuring rangers from the New Orleans Jazz National Historical Park. Join us at 1400 through 1500 hours for the Marine Forces Reserve Brass Band as they perform Jazz, Blues, and Funk for your listening pleasure. Semper Fidelis! New Orleans Artists Against Hunger and Homelessness presents Legacy of Caring Concert Celebrating Allen Toussaint. Award winning producer and public radio host Fred Kasten interviews Gregory Davis. Hear this New Orleans musician's story from coming to music to where they're going now. Join pianist Joe Krown for an interpretive musical performance featuring traditional New Orleans standards and piano styles. Samantha Pearl performs at the New Orleans Jazz Museum on Friday, November 16 at 2:00pm. Tickets are $8.00, available at the door or online, and include admission to the Jazz Museum exhibits. Ruben Watts & Peter Boutte are a New Orleans based band that use New Orleans street rhythms with free improvisational melodies. Join us on Thursday, November 8 at 6:00pm for the opening reception of the New Orleans Jazz Museum's latest exhibition, Drumsville! : Evolution of the New Orleans Beat. Join us for the Second Thursday Lecture with Jacques Royal on November 8, 2018 at 2 PM. This event is free and open to the public. A pianist will perform for this Wednesday's piano hour from 2-3 p.m. This event is FREE and open to the public, sponsored by the New Orleans Jazz National Historical Park. Trevarri performs at the New Orleans Jazz Museum on Friday, September 21 at 7pm. Tickets are $15.00, available at the door (cash) or online here. Join us for the musical stylings of Los Tres Amigos from 2 p.m. to 3 p.m.! Award winning producer and public radio host Fred Kasten interviews Quiana Lynell. Hear this New Orleans musician's story from coming to music to where they're going now. Join us on Thursday, August 16 at 2pm for Adonis Rose's Prodigy Project. Free and open to the public, sponsored by the New Orleans Jazz National Historical Park. Join Dianne Honore' and the Black Storyville Baby Dolls as we host the 2nd annual Black Storyville Cultural Heritage Awards at the New Orleans Jazz Museum! The Rock & Rouge Women’s Music & Food Festival will be held at the New Orleans Jazz Museum at the Old US Mint on Saturday, June 16th from 10 am until 10 pm. Award winning producer and public radio host Fred Kasten interviews New Orleans bassist Jason Stewart. Hear this New Orleans musician's story from coming to music to where they're going now. Pianist Ranger Jon Beebe performs an hour of traditional New Orleans and contemporary Jazz. Ranger Jon will be joined by the Arrowhead Jazz Band and other special guests. Robert J. Cangelosi Jr., an adjunct lecturer at the Tulane University School of Architecture, will present an in-depth program on historic home research at the Old U.S. Mint at 9:30 a.m.
Join us at the New Orleans Jazz Museum on Friday, June 22 at 2:00pm for the All For One Brass Band. Join us on Thursday, June 21 at 6:00pm for the opening reception of the New Orleans Jazz Museum's latest exhibit, Jazz En Route to France 1917-1918. Music by Jelly Roll Morton, Louis Moreau Gottschalk, Paquito D’Rivera, Wynton Marsalis, and Maurice Ravel. Enjoy an hour of jazz trio lead by Kris Tokarski on Thursday, May 24 from 2-3pm. Free and open to the public, this event is sponsored by the New Orleans Jazz National Historical Park. Join us Thursday from 8pm to 11pm for renowned contemporary instrumentalists FLOW ft. Will Ackerman, Fiona Joy, Lawrence Blatt & Jeff Oster. Renowned musician Gabriel Mark Hasselbach presents a special album-release concert at the New Orleans Jazz Museum on Friday, April 27 at 2pm. Free and open to the public. Free and open to the public, join us for the French Quarter Festival at the New Orleans Jazz Museum at the Old U.S. Mint! Join us for a special program with Dianne "Gumbo Marie" Honore on Wednesday, April 11 from 2pm to 3pm. Wednesday, March 28, features Esther Rose, Meschiya Lake, and Dayna Kurtz (official), moderated by Jen Odell. The program begins at 6:00pm.